The most popular excursion from Arequipa is to the Colca Canyon, one of the deepest canyons in the world, and twice the depth of Arizona's Grand Canyon. The Colca valley is extremely picturesque, dominated by huge mountains, with little villages and a distinctive traditional dress, lively market places and grand churches, green agricultural terraces hugging the hillsides, and herds of wandering llamas. The Crux del Condor Lookout is the most popular viewing point and also the best place to see giant condors soaring on incredible wingspans above the dramatic depths of the canyon below. Many people stay in the quaint market town of Chivay, three hours from Arequipa, with a good range of accommodation, restaurants and bus services, and an excellent base from which to explore the region at leisure. There are many hiking opportunities in the surrounding hills and energetic travellers can hike down to the bottom of the canyon and overnight in one of the tiny Indian settlements below. There are many tour operators competing to offer various tours of Colca Canyon, varying from a few hours hiking, to multi-day packages. 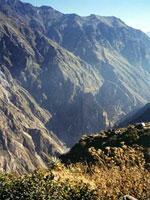 It is also easy to set off alone and self-guide through the beautiful region. Transport: Public bus from Terminal Terrestre or San Juan de Dios 510, Arequipa. Organised tours also visit the canyon daily. It is a five-hour journey.